【DID YOU ALWAYS WANT TO HAVE A MULTIFUNCTIONAL AND LIGHTWEIGHT SELFIE STICK】Yep, screwing a monopod selfie stick with a heavy tripod, is a pain. Our lightweight foldable selfie stick was designed to eliminate this to make a ordinary Selfie Stick lighter but more functional. 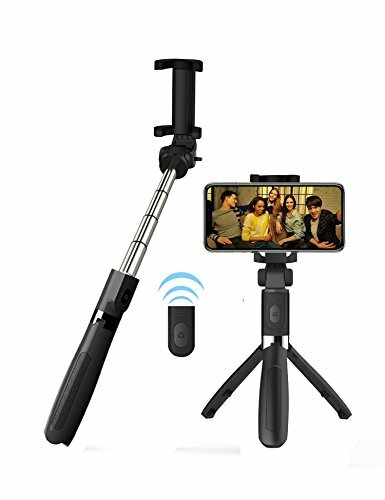 【SELFIE STICK TRIPOD WITH BLUETOOTH REMOTE】 -- 2 in 1 selfie stick tripod with built-in Bluetooth remote , allows you to take selfie-photography or you could separate the controller to take group photos like parties, graduation, wedding, travel. 【WHY CHOOSE OURS?LIFETIME QUALITY CARE】Our customers come first. BETTER SELFIE STICK, ZERO RISK is not just a slogan we care about our customer experiences. awards 30 days money free back, 18 months seller warranty and lifetime dedicating support to assure your long-term enjoyment. If you have any questions about this product by Alptoy, contact us by completing and submitting the form below. If you are looking for a specif part number, please include it with your message.